The system is not perfect but it’s cheaper, safer and guarantees our freedom better than what is being proposed as “bail reform”. Most people accused and then arrest for a crime are not convicted for it. A very high percentage of people that are arrested did the crime that they were arrested for but are not charged for it, due to lack of evidence. Or because no one wants to testify against them. Simply stated, the government could not build a strong enough case against them for a conviction. Most people arrested for domestic violence are never convicted for it. The amount of people that are totally innocent that have been arrested and convicted is VERY small. We are talking less than 1% of 1%. In most cases, the only punishment for the accused crime is the process that one has to go through. Your charges are dropped due to lack of enough evidence or the good work of your attorney. With “bail reform” after an arrest your information is taken at the jail and you are released back into society within hours. Doesn’t matter what the nature of your crime was. Violent or non-violent crime, bail reform is based on everyone being able to go free before trial that could not afford bail. Oh wait; the government can pick and choose who can go free under the new bail reform system. They somehow fail to point that out to us. Everyone will not go free. The government will decide and under what circumstances your freedom will be granted. Unlike the bail system that we work under now (a constitutional right by the way) the government will now be able to determine who will be set free and who stays in jail. The current system allows bail for all who are eligible and is guaranteed by our constitution. With the proposed bail reform, your freedom will now be in the hands of the government to decide. The cost of “bail reform” is very expensive. Open your wallet because you, the tax payer will be paying for it. More taxes, more government will be needed to replace a system that cost the tax payers NOTHING now. All who are released without bail and do not attend their court date will have to be searched for and arrested by the local police. Local cities will have to hire more officers being paid for by the taxpayer. Etc. I could go on but I think at some point you have to decide how do you want your freedom safe guarded? By the people through a constitutional right that is already in place. Or by a local government agency that will cost us much more in taxes. I received a noticed in the mail, requiring me to report for jury duty by calling a phone number on the day before I was to report. All other times when I called, I was told, by recording that my service were not needed and that would be the end of it. But not this time, it seems that my presents was needed at the courthouse Monday morning at 8:30am sharp. From 8:30 am to about 10:15 am we listen to some instructions and watched a video overview of what we could expect from jury duty. We were given a short break and upon our return we were given badges and told to report to the courtroom. After we were settled in, more instructions were given, this time from the Judge. I listen to these instructions a little more carefully. When the Judge finished, we then were introduced to the DA, defending counsel and the defendant. The Judge now instructed us how to request to be dismissed due to a hardship that we may incur if serving on this jury. I tried to get out of jury service due to being self-employed - I am not compensated for my time serving on the jury. I told the judge that if I don't work I don't get paid. She asked if I had any saving which I answered with an affirmative and was told that the hardship only applies to those who do not have savings. You will continue with the jury selection process. I thanked the judge and left her office being told to report back after lunch. After lunch 18 jurors were called by the number we were assigned. My number was not called. More instructions were given by the Judge and we all listened. They were to answer 12 or 13 questions given to them out loud in front of the rest of us. Any military service, how were you discharged? Have you ever been in a courtroom before if so for what? Have you been a victim of a crime? 2) Go by what the law states as it applies to the case. The DA starts talking again. This time he tells everyone that is still listening about some crazy laws that are still on the books in some states. One of which is in PA that states that after each mile you drive you must stop and shoot up a flare. Now he poses this question to individual jurors. If you were on the jury (today) and it was proved within reason that the defendant did not fire off the flare, would you find him guilty? I could not believe what I was hearing. You have to be kidding me. They were sheep that cannot use or don't have any common sense. The people answering this question were college educated some with high level degrees. Hell one juror was a physicist that answered guilty. Another question posed, was if you thought that anyone on trial in Alameda County was innocent. This question was asked right after the DA and the Judge earlier explained that everyone is presumed innocent until proven guilty. Again one by one each juror answered with something close to, "Well maybe" or "There is a chance that one could be." I had to suppress my urge to raise my hand voicing oh, oh pick me, like Horseshack on "Welcome back Carter." I also had to contain myself from yelling out the correct answer that, “everyone on trial is innocent until convicted.” Instead I just sat there shaking my head in disbelief. Most jurors did not understand the follow statement. Would you agree that it's better to let ten guilty people go free than to have one innocent man go to jail? "No the innocent man should not go to jail," said most jurors. "No, you should not let ten guilty men free." No matter how the defense attorney phrased the question she could one get one straight answer from the pool of 18. This was scary. Someone’s life was going to be judged by 12 people that could not understand simple concepts and could not use common sense. After all follow up questions were complete the Judge asked if the Attorneys wanted to dismiss any jurors. Both attorneys stated no and the Judge looked up in shock stating, "That this is the first time that has ever happen in my court." The Judge thanked the rest of us for our time, service and dismissed us. I was not needed for jury service this time. Just a Waste of the Tax Payers Money? The bill by Assemblyman Rob Bonta (D-Oakland) was the last proposal to be reconsidered for a vote and failed to make it out of the chamber in July., with 36 lawmakers in favor and 37 opposed. A copycat bill by state Sen. Bob Hertzberg (D-Van Nuys) wants to push this so called reform on the taxpayers no matter what the cost maybe. "This bill is clearly not a remedy for something that needs reform," Assemblyman Tom Lackey (R-Palmdale) said. "It is a dismantling." Know the facts about bail and the true cost that Sen. Bob Hertzberg (D-Van Nuys) bill will cost the taxpayers. According to data presented in the LA County Sheriff Department's 2016 report, “Custody Division Year End Review for 2016", there does not seem to be a "poor person" problem in the LA County Jail System. The report shows that the inmates that came through the jail on low-level, non-violent misdemeanor charges (property, drugs, vehicle infraction, etc.) comprised less than 5% of the population If you remove those who are in mental health housing, the number drops to 3%. And that number includes those individuals that were able to bail out. If you eliminate the people who did bail, there is no doubt that number of people still in custody becomes even smaller. Additionally, only 3% of inmates in the LA County jail were there on a bond under $25,000. Over 74% of inmates were there on a bond over $100,000 or had a "no bail" designation. Do these stats tell a story that sounds like LA County Jails are filled with "poor people" who can't afford a bail bond? It is time for California legislators to step up and start questioning the mythical numbers being perpetuated by those pushing for bail reform. It is time for California legislators to look at the real data in our jail populations so that we can develop real solutions to real problems, as opposed to pushing a one-sided and potentially dangerous advocacy agenda on our criminal justice system. Californians deserve to know the truth, and deserve to have representation that honestly and meaningfully protects their families and communities. Circa 2010 I was in a training class when the instructor asked, "What does a farmer get when he plants his crops?" After some discussion about the Farmer having to water and fertilise the answer was, "his crops and weeds." Now the instructor made a big point about how the farmer had to take care of his crops and if the farmer did nothing, all he would get is weeds. It was right at this point that I zoned out and wanted to make my business like a weed. I think I was so zoned out I even said it out loud without even knowing it. I want to be like the weed! When I came to I could hear the instructor laughing and saying no one wants weeds and you can't eat weeds. I think if I recall correctly he was even shaking his head at me as if I was just not getting it. Some of the other students were even joining in with the laughter. I on the other hand was thinking of things that the rest of the class had no idea about. Columbus was laughed at too. It didn't phase me, Hell, I think it even motivated me, I was going to take my business to the next level. I am going to become the Weed! Think about this for a moment, if you do nothing, it will still grow and thrive. You could have a beautiful garden but someone else looking at it will tell you, "You missed that weed right there!" The garden is beautiful but everyone noticed the weed. Lesson #1 - My advertising is weed like. Everyone sees it, be like a weed when it comes to advertising. Set up your business advertising on the web and just let it run or in my case, grow wild like a weed. No one notices the beautiful rose next to the other beautiful rose but everyone will notice the weeds. If I were to be a superhero, wait scratch that, I am a superhero, I am the weed! I'm sure that the motivation from that class has worn off all the students by now, me on the other hand, my business still grows from the power of the weed. Behavior: This most directly controls our success or failure. Feelings: If you feel good or positive about something, you will behave more positively about it. Your feelings will directly influence your actions. Attitudes: Your attitudes are the perspectives from which you view life. Beliefs: Your attitudes are controlled by your beliefs. Belief does not require that something be the way we see it to be. It only requires us to believe that it is. What reality is, to each of us, is based on what we have come to believe, whether it's true or not. Programming: We believe what we are programmed to believe. Do you want to be more successful? You will need to change your programming. Open your mind to other beliefs or ideas. Q: Who can bail my loved one out of jail? A: The bail bond process is regulated by the State of California through the Department of Insurance. All persons negotiating bail must be licensed by the California Department of Insurance. 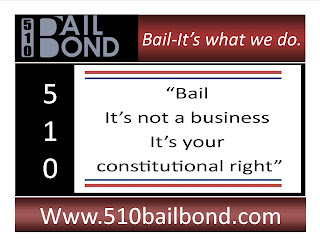 You need to talk with a 510 Bail Bond licensed bail agent. All of our agents are licensed to conduct bail at all California jails. Q: How is the bail amount set? A: The Judge within the county of arrest sets the bail amount. Q: How can we pay the bail amount? A: All 510 Bail Bond agents are able to accept payment by cash or credit card for your convenience. Ten percent of the bail bond amount is the fee 510 Bail Bond charges. This fee is regulated by the California Department of Insurance. Q: How long does the paper work take? A: The Bail bond paper work will take less than 20 minutes on average. Q: How long does it take for a person to get out of jail? A: This depends on the jail. 510 Bail Bond doesn’t control this. Once we post the bond at the jail that will start the release process. Each jail is different, most local jails release within 30 minutes of us posting the bond. The County jails release times are 2-4 hours typically but have taken up to 10 hours on some occasions. Q: Once released what are the responsibilities of the defendant? A: The defendant must meet with a 510 Bail Bond agent within 24 hours to fill out all paperwork. Q: Do I get the bail bond money back? A: No the bail bond money paid to 510 Bail Bond is our fee and is considered earned the moment the defendant steps out of jail. It is not refundable. Q: If I have other questions who should I ask? A: You can have all your questions answered by your 510 Bail Bond agent. We understand that you are our clients and we will do everything humanly possible to make sure you fully understand the process and that all your questions are answered. Q: Why can’t you recommend an attorney? A: We are not permitted to recommend attorneys by law. Do you have a question that you would liked answered here? Send us an e-mail and we will answer all your related questions here. 510 Bail Bond is constantly reviewing our underwriting policy as it regards to old and new laws. As more laws are added to the books the more likely you will need our services. The domestic violence laws in California is a good example of 510 Bail Bond policy of easy underwriting and approval when charged for domestic violence PC 273.5. We know that most cases were blown out of proportion by the arresting agency and you simply want your loved one out of jail. Simply stated, give us a call and we will bail your loved one from jail. In a report titled, “California response to domestic violence:” Dated June 2003 from the California Senate office of research. First off as a strong supporter of freedom I am generally against any new laws from the stand point, more laws = less freedom, more chance of you being arrested. At some point we will not have any freedom and will be subject to arrest at the governments will as more laws are put on the books. Having stated the above lets take a look at what this new law has done. Again from the same above mentioned report. "The most recent research on the effectiveness of pro-arrest (the policy that California has) and mandatory-arrest policies “found good evidence of a consistent and direct, though modest, deterrent effect of arrest on aggression by males against their female intimate partners. Between 1990 and 2000 under Section 273.5 -- the percentage of arrests of females more than doubled. Still, more than 80 percent of arrested suspects were male." I don't know how this report can claim that the domestic-violence laws had a deterrent effect of arrest when more arrest have been made. As far as a deterrent, no law has been a deterrent against crime. Crime will happen at a steady rate, laws are in place to punish those who break the laws. As more laws are put on the books, more people will be subject to arrest. Now I don't know if this bill righted a wrong against men with regards to domestic violence but I can assure you that was not the intent of the bill. More woman have been arrested for domestic violence and the bail for a domestic violence charge also increased to $50,000.00. Before the domestic violence laws came into play one would of been arrested for an assault or some other lower level crime as far as fees were concerned. The domestic violence laws on the surface seem like good reform but in fact have led to higher arrest rates of women and more fees required of the arrested to pay. "The bottom-line from this San Diego County study, is that 33 percent of domestic-violence cases resulted in an arrest and 17 percent of cases resulted in a guilty plea or a conviction." The following is a recent call from a client regarding a domestic-violence arrest of her spouse. The wife was upset with her husband and was waiting out side in their driveway when her husband drove up. The wife started arguing, their voices become louder, neighbors noticed, the husband did not want to deal with this outside so he "pushed" his wife aside to enter the house. It was more of a slow wide swim move of one arm but was described as a push to the police during questioning. If the couple remained silent and did not comment on the charges there might not of been an arrest. The issue was settled inside without violence, about fifteen minutes later the couple was making diner when the police arrived at their door wanting to questioning them regarding the incident. The police received a call from a concerned neighbor regarding a domestic dispute. After investigation the police determined that the husband was the primary aggressor based on the statement that he pushed his wife, he was arrested for domestic-violence under current California law. Bail was set at $15,000.00. This is considered a low bond amount for domestic-violence charges, usually we see bail set at $50,000.00. This was a clear case of an arrest that did not need to happen. Not using their fifth amendment right and the couples lack of mastery of the English language were the main cause of arrest, not the domestic-violence that was charged. The real story is that 83% of people charged with domestic-violence cases are bonded out at higher bail rates then before, spend time in jail, pay an attorney and have their cases dropped. Not much of reform if you ask me. For your Bail Bond needs in the city of Fremont and throughout the State of California, give us a call. Everything you post, pin, tweet, text, share on social media sites are being tracked and recorded to create a profile of you for many different uses. Companies are using the information to market goods and services to you and making decisions to hire or not, all based on your actions on social media. When you send a text, or post to a social media site the contents are no longer under your control. They can be re-tweeted, shared or even changed and posted somewhere else. It does not end there, it will still be linked to you. "The biggest mistake that people make on social media is that they let their post live forever." Said Mark Cuban in an youtube video. Mr. Cuban even goes as far as to state that your posts on social media may lead to your arrest. 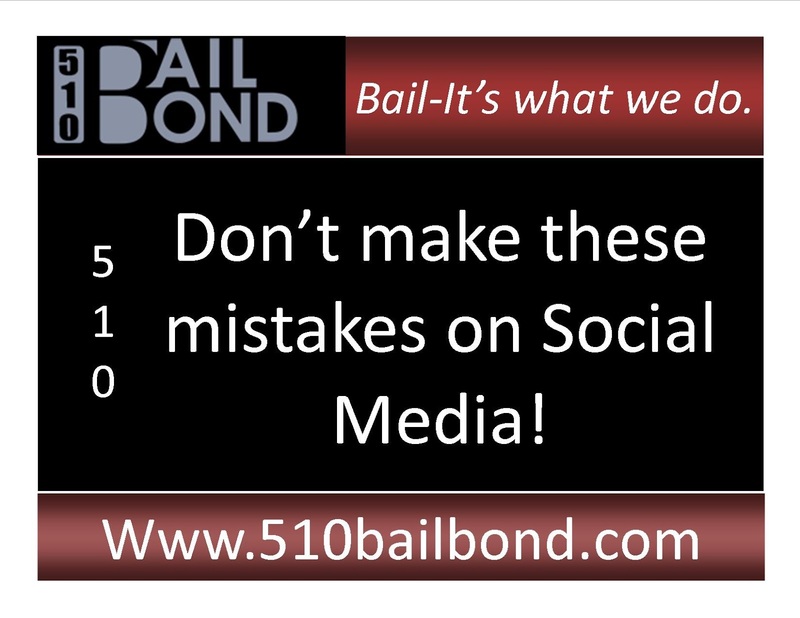 You need to have 510 Bail Bond programed into your contact information for easy retrieval when needed at a moment's notice. Your freedom and way of live needs to be protected at all times. Take a look at this video by Mark Cuban through this link from 510 Bail Bonds . How times are changing. There are thousands of new laws put on the books each year. Many of you may think that is a good thing, but in realty that means there will be a thousand more ways you could be arrested. Think about that for a minute. The land of the free is becoming smaller and smaller each year as the government finds more ways to arrest and to control the public. Our jails house more people than any other country in the world does. If you value your freedom visit our contact bail bond page and program in your call to freedom. 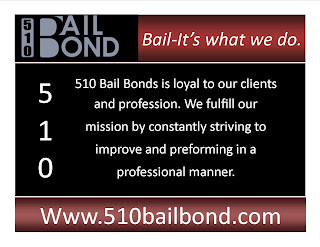 510 Bail Bond services the Fremont Jail, Hayward Jail, Santa Rita Jail, San Francisco Jail, San Jose Jail - all jails from San Francisco out to the Sacramento Jail. If you're in jail we have your bail. 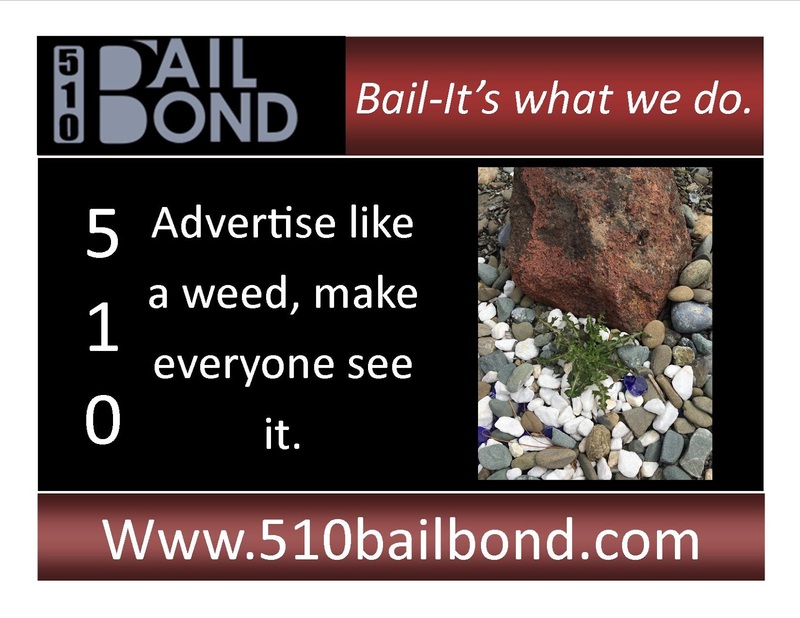 Give 510 Bail Bond a call to set your loved one free. 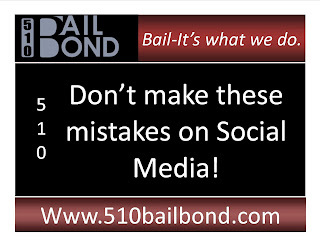 See the seven mistakes made on social media that required the need for bail. "In England, sheriffs originally determined whether to grant bail to criminal suspects. Since they tended to abuse their power, Parliament passed a statute in 1275 whereby bailable and non-bailable offenses were defined. The King's judges often subverted the provisions of the law. It was held that an individual may be held without bail upon the Sovereign's command. Eventually, the Petition of Right of 1628 argued that the King did not have such authority. Later, technicalities in the law were exploited to keep the accused imprisoned without bail even where the offenses were bailable; such loopholes were for the most part closed by the Habeas Corpus Act 1679. Thereafter, judges were compelled to set bail, but they often required impracticable amounts. Finally, the English Bill of Rights (1689) held that "excessive bail ought not to be required." Nevertheless, the Bill did not determine the distinction between bailable and non-bailable offenses. Thus, the Eighth Amendment has been interpreted to mean that bail may be denied if the charges are sufficiently serious. The Supreme Court has also permitted "preventive" detention without bail. In United States v. Salerno United States v. Salerno, 481 U.S. 739 (1987), the Supreme Court held that the only limitation imposed by the bail clause is that "the government's proposed conditions of release or detention not be 'excessive' in light of the perceived evil." In Stack v. BoyleStack v. Boyle, 342 U.S. 1 (1951), the Supreme Court declared that a bail amount is "excessive" under the Eight Amendment if it were "a figure higher than is reasonably calculated" to ensure the defendant's appearance at trial.1"